In an essay included in the accompanying booklet, Jonathan Rosenbaum points out that Michelangelo Antonioni’s L’Eclisse (1962) was the final film in a “loose trilogy about Eros, art, business and emotional alienation in the contemporary world.” The film was a continuation of important thematic preoccupations, including “objects and places overtaking and supplanting people.” The presence of architecture and its relation to the characters in his films is one of Antonioni’s distinctive features for he is a filmmaker interested in how Modernism drove people apart. The film begins with an ending. Vittoria (Vitti), a translator in a Roman suburb, leaves her lover, Riccardo (Rabal), a writer. It becomes obvious that they have a loveless relationship. There is virtually no dialogue between them for the first five minutes of the film. None is needed as Antonioni conveys the emotional distance between them spatially. They are in the same room together, but emotionally they could be miles apart. Riccardo’s attempt at showing anger at her leaving is also ineffectual. He knocks over and shatters a small knick-knack. At one point, Vittoria looks out the window at an immense, mushroom shaped tower that dominates the frame and symbolically renders Riccardo impotent. This imagery continues as she leaves his apartment and walks away through tall trees and the phallic tower in the background dwarfing her and Riccardo. Vittoria ends up meeting a smart and shrewd stockbroker named Piero (Delon) and they attempt a relationship of some kind, but it goes no where. She comes across as a distant person, never really connecting with her lovers in a heartfelt, meaningful way. L’Eclisse lacks any kind of traditional narrative and Antonioni does this on purpose in order to draw attention to the characters and, more importantly, the spaces that they inhabit (and the ones they do not). As stated above, architecture plays an important role in this film. At times, it is a threatening presence. In one scene, Vittoria is wary of a series of flag poles swaying ominously in the wind and then via a high angle shot, she’s framed being dwarfed by a large statue. Characters always seem to be at the mercy of their environment. Antonioni also uses physical space as a metaphor for relationships between characters. In one scene, Riccardo tries, in vain, to enter Vittoria’s building. The lobby is devoid of any objects or people. It is an empty space and this could also represent his failed relationship with her. It’s almost as if he is trying to get into her heart but there is nothing there for him to have. For several films Monica Vitti was Antonioni’s muse. She looks absolutely gorgeous in L’Eclisse and Gianni di Venanzo’s photography perfectly captures her beauty in the way he lights her in any given scene. But Vitti proves that she has range and is more than just a pretty face. She shows a capacity not only for conveying alienation, but light comedy (which she was known for before she appeared in Antonioni’s films) in a scene where she dresses up as a woman from an African tribe and dances to ritual music for the enjoyment of her two girlfriends. However, her donning black-face seems quite racist now and one of her friends even calls her on this. Vittoria is an unattainable presence as both Riccardo and Piero try to get involved with her, but she spurns them both, not because she doesn’t have feelings for them, but because she doesn’t know how she feels about anything. Vittoria seems to wander through the movie from place to place looking for something. What this might be is the mystery of the film as much as the missing woman in L’Avventura (1960) was in that one. 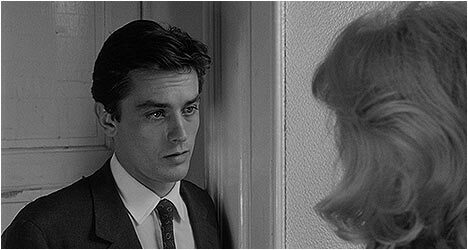 This Blu-Ray transfer for L’Eclisse is striking in its detail and the richness of the black and white image, crucial for a film rich in atmospheric cinematography. There is an audio commentary by Richard Pena, program director of the Film Society of Lincoln Center in New York City. He delivers a scholarly commentary, but one that isn’t too dry. He packs in a lot of factual information and analytical discourse as he expertly dissects the film’s style and themes. In many respects, it is akin to sitting in on a really good film lecture. The second disc features a documentary on the career of Antonioni entitled, “The Eye That Changed Cinema,” that was created in 2001 by Sandro Lai. It starts off with the filmmaker’s documentary period in the 1950s and goes up to the opening of his museum in the 1990s. In between, it hits all the major works, L’Avventura, Blow-Up (1966) and so on as well as covering important collaborators like Monica Vitti. “Elements of Landscape” features interviews with Italian film critic, Adriano Apra and longtime Antonioni friend and collaborator, Carlo di Claro. They talk about the filmmaker and their thoughts on L’Eclisse. Apra claims that the movie was the farthest that the director ever went with his style and distinctive worldview. He also points out that the movie did not do well in Italy but was successful in Japan which he attributes to its Zen-like quality. Both of these extras convey a filmmaker who went beyond traditional storytelling and experimented with the form in a way that made his films difficult to digest in a conventional way.